If this album was a true collaboration and had come out a decade ago, I probably would have pre-ordered it months in advance and excitedly camped out in front of my mailbox waiting for it to arrive. Sadly, it is not (it is a split) and it did not, though Stator is still an admirably solid album. Also, any fresh dispatch from Helge Sten’s Deathprod project is always welcome. That said, Geir Jenssen is the one who unexpectedly steals the show on this album, offering up some atypically dark and heavy fare to meet Sten’s bleakness halfway. Deathprod, of course, remains as characteristically blackened as ever. Notably, this is not the first time that these two have paired for a split album, as Biosphere and Deathprod previously joined forces to pay tribute to Norwegian composer Arne Nordheim on 1998’s Nordheim Transformed. Stator might have some larger purpose as well, as it is a commissioned work seemingly based upon the varying meanings of “stator,” which generally describes the stationary parts of a rotating assembly, but originates from the Latin word meaning “one who stands by.” While that theme is not particularly evident in the finished music without some serious mental gymnastics, it may have either shaped the process or manifested itself in too abstract a way for my feeble mind to comprehend. I suspect I will probably never know for sure. The first time I listened to Stator, I did so blindly and was unaware that it was a split rather than a collaboration. Then I listened to it somewhat blindly again, knowing that it was not a collaboration, but not knowing which artist was responsible for which pieces. I found it unexpectedly difficult to tell who was who: Jenssen and Sten did a remarkable job finding a middle ground between their somewhat disparate aesthetics and holding a sustained mood of enigmatic ominousness (Geir did most of the heavy lifting, of course, as it is impossible to imagine Deathprod edging towards warmer, more melodic territory). Stator is a very well-sequenced and thematically/stylistically coherent whole. That said, once I finally confirmed who was responsible for each piece, the differences between the two artists came very sharply into focus–anything that has anything resembling melody or structure was the work of Biosphere, while Sten’s contributions are mostly murky, amorphous voids of blackness. That should surprise no one. It is equally unsurprising then that most of Stator’s most memorable moments belong to Biosphere. One of the album’s finest moments, for example, is “Space is Fizzy,” which is built upon a throbbing pulse that twists into an oscillating negative image of itself at regular intervals. Even better still is the warm drone of “Baud,” which is the most distinctively “Biosphere” piece on the album, but escapes being business-as-usual by augmenting its dreamy thrum with stuttering and sputtering synth textures. Also of note is the evocative opener “Muses-C,” which initially feels like a looping, blurred, and flickering reel of a fighter plane firing its afterburners. Although he seems mostly content to contribute brief brooding interludes between the more substantial Biosphere pieces, Helge does admirably rise to the occasion in two instances. The first is “Shimmer/Flicker,” a roaring and grinding nightmare of piece that lamentably dissolves into something resembling large, rippling drips in a cavernous subterranean lake after just two minutes. That second part is certainly likable in its own right, but it is unavoidably anti-climactic after such a crushing opening. Later, however, Deathprod finally gets everything exactly right: the album-closing 10-minute “Optical” resembles nothing less than a visceral, slow-motion avalanche. Like most of the Deathprod pieces on the album, “Optical” demands to be listened to loudly on headphones–Sten does not deal in immediately gratifying things like hooks or rhythms; he weaves nuanced, complexly layered hellscapes. It would not be fair to call Stator a flawed album because it is legitimately excellent, but there are a number of exasperating little things preventing it from being even better than it is. For example, Geir Jenssen has no shortage of great ideas, but tends to blunt them somewhat by coming across as too conspicuously composed–his well-earned illusions of otherworldliness are dispelled by very earthbound nods to modern composition and his techno past. Sten, on the other hand, always manages to keep his work organic, complex, dynamic, and distinctively his own, yet rarely finds an inspired core motif upon which to apply his prodigious talents. That said, each artist does manage to transcend those limitations at least once on Stator: Biosphere’s “Baud” and Deathprod’s “Optical” both easily rank among each artist’s finest work. It is hard to complain that an album only boasts two sustained flashes of brilliance, but the pessimist in me cannot help but see a stunning version of Stator that might have been. Alas. High expectations are a killer. That said, Stator is still one of the better albums to come out this year. It is a relief to know that Sten and Jenssen are still just as capable of greatness as ever, even if it is intermittent. These two heavyweights of Norwegian electronics have in fact been paired together on disc once before. 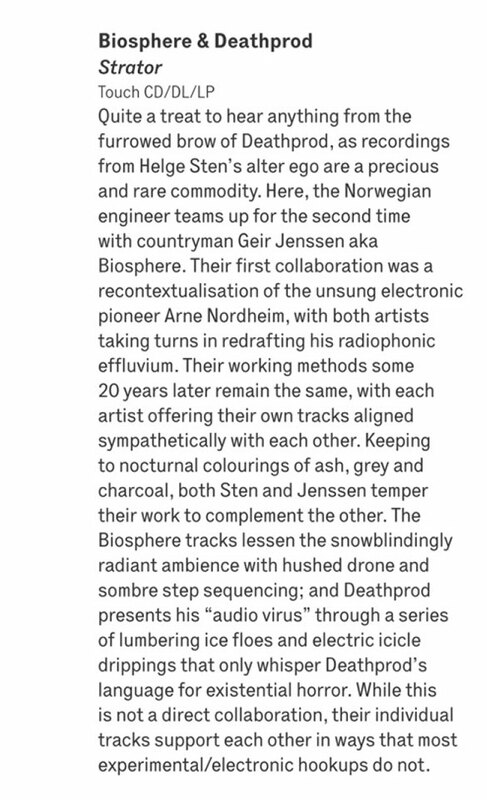 That album found both Geir Jenssen (aka Biosphere) and Deathprod (aka Helge Sten) remixing various compositions of Arne Nordheim – the pioneering electronic composer of Norway from the ’60s. Stator, like the Nordheim remix project, is NOT a collaboration, but a split release that alternates between the two. We definitely get the sense that Jenssen is hedging his sound towards that of Sten, as this album harbors a considerable bleakness within the radiant black drones that’s far more fitting of the Deathprod catalogue than that of Biosphere. Deathprod’s recorded work is very much a rare commodity, with his four albums that were released collectively on a boxset through Rune Grammofon for his epic black ambience and elegantly dark moodscaping. Outside of the boxset and that remix project (both of which are long out of print), there’s very little else, making any new Deathprod material very welcome, indeed. As we mentioned, the album alternates between the Biosphere and the Deathprod material, with the Deathprod tracks sprawled as expanses of cold drone and Morton Feldman-like electronic compositions of tone, color, and pace. The Biosphere tracks are equally as impressive, as shivering, radiophonic works of tremolo’d ambient glimmering upon deep dark rumbles and the occasional step-sequenced ruminations that act as ghostly distillations of his once and former techno past. So so good! 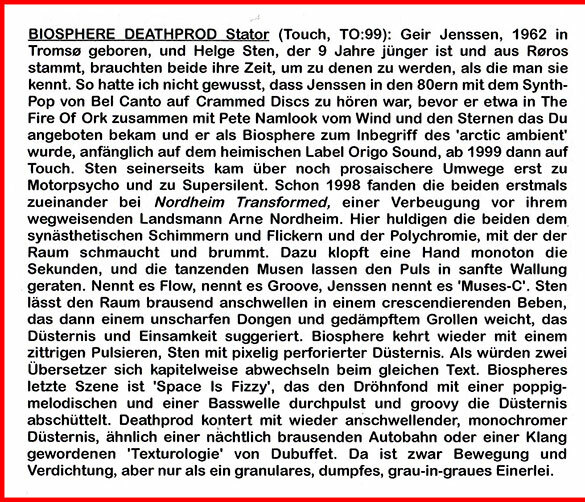 In 1998, Biosphere and Deathprod – Geir Jenssen and Helge Sten, respectively – released “Nordheim Transformed“: a split album where both artists transformed the original experimental music of (fellow Norwegian) Anne Nordheim’s “Electric” (1974) almost beyond recognition. It’s not completely clear whether Geir and Helge actually worked together on this album – it’s a split, where different tracks are each credited to one of the two artists – but from its coherence it’s clear that they at least influenced each other greatly in producing this album. “Nordheim Transformed” is a landmark album in both artists’ catalogue – as well as for the ambient music genre in general. For Geir Jenssen and Helge Sten, it’s a return to classic electronic ambient form: no acoustic instruments are in sight. Both artist have a somewhat different musical approach so it’s quite easy to hear who contributed what track: Biosphere delivering the industrial rhythmic sounds (the kind of sound that brought him his immense popularity) of “Muses-C”, “Baud” and “Space is Fizzy” – while Deathprod , on the other hand, performs more abstract deep dronescapes in “Shimmer Flicker”, “Polychromatic”, “Disc” and “Optical”. 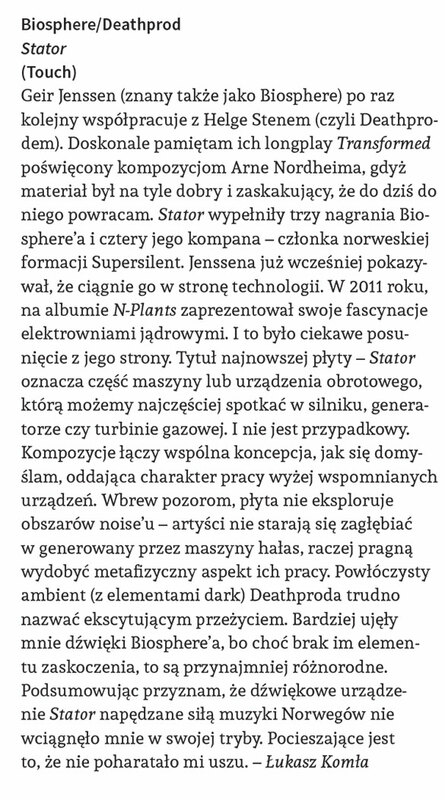 Two well-known artists of experimental music join (not for the first time) to compose ‘Stator’, an album of seven pieces of drone and ambient created by Norwegian Geir Jenssen aka Biosphere and Helge Sten under the moniker of Deatprod. Biosphere generated considerable notoriety with his debut album ‘Microgravity’ (Origo Sound, 1991) and became an icon of ambient music scene. Also influenced by the techno beats can be shown in his albums ‘Microgravity’ and ‘Patashnik’ (Origo Sound, 1994) or organic sounds on ‘Shenzhou’ (Touch, 2002) and minimal ambient on Autour De La Lune (Touch, 2004). ‘Muses-C’ composed by Biosphere takes us to abrasive atmospheres accompanied by a loop while emerging a soft digital percussion. ‘Shimmer/Flicker’ created by Deathprod is a profound journey unfolding a dark Wagnerian orchestra. On ‘Baud’ (Biosphere) appear a repetitive, intermittent notes and clicks as if they were a preamble to an abstract film, so on the same side is ‘Polychromatic’ of Deathprod. ‘Disc’ (Deathprod) is enveloping with ambient lines while some glitches spread out. ‘Space is Fizzy’ (Biosphere) suggests go into the Kosmische corridors. ‘Optical’ of Deathprod that closes the album continues with the abrasive atmospheres of ‘Muses-C’ that slowly disappear over the horizon. The music on this album is intense and unsettling and hypnotic. For the second time, Geir Jenssen (Biosphere) and Helge Sten (Deathprod) have worked together on an album. The last time they cooperated, the result became a classic in the ambient world, named Nordheim Transformed. 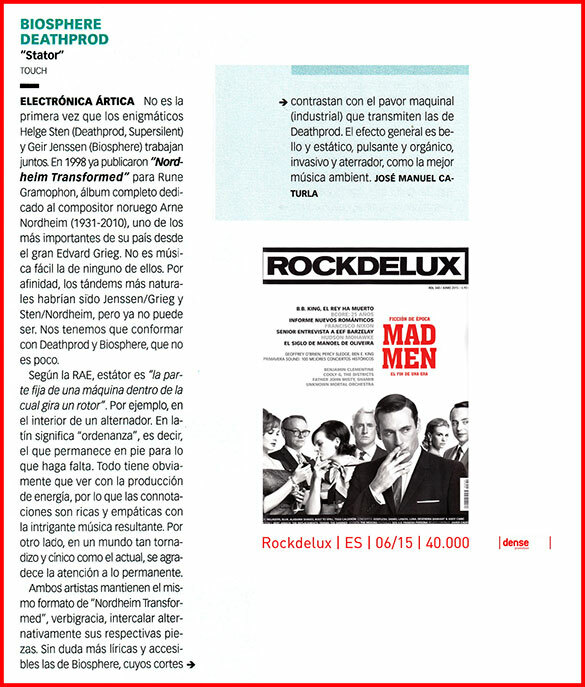 Both projects have been working and experimenting with electronic music since the nineties. Biosphere, off course, is well-known for the ambient-techno hit ‘Novelty Waves’ but he also made some classic albums and soundtracks. Deathprod is known for his (dark) ambient albums and his work with Motorpsycho and Supersilent . So, there’s about fourty years of ambient experience on this disk and I couldn’t wait to get my hands on it. 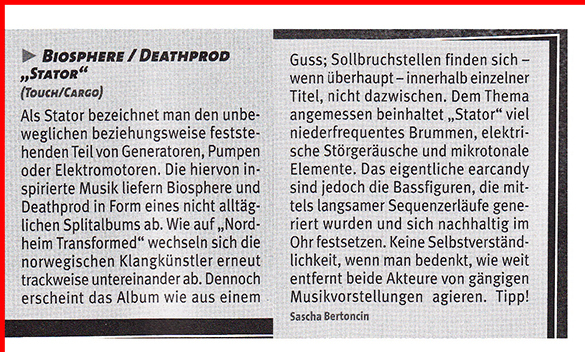 Biosphere opens and takes every odd-numbered track on the album while Deathprod takes the even numbers. Both of them mainly focus on minimal ambient where otherworldy sounds come floating in and out over a number of loops. That’s a very unpoetic way to describe this album, but regarding the combined experience these projects have, you can be quite sure the endresult is beautiful, relaxing and quite a bit adventurous. For an ambient album like this, there’s plenty of variation. Be it the minimalist percussion in ‘Muses-C'(Biosphere), the thundery drones in ‘Shimmer Flicker’ (Deathprod), the abstract sounds in ‘Baud’ (Bioshpere) or the floating soundscapes in ‘Disc’ (Deathprod), every song and every piece of sound has its place and its function. All of these little aspects help making the album complete and extremely enjoyable. My absolute favourite on this album is ‘Space Is Fizzy’, a calm but rhythmic piece with a slight trance-effect. However, the other tracks fit in perfectly with each other. At moments, there’s a slight noise-level but those quickly fade away into the same ambient wall-of-sound both acts create. All tracks are quietly balancing on the edge, the thin line where this thing we call music fades in and out off the lives we live and the surroundings we experience. That’s a more poetic description, finally. None of both projects has been experimenting a lot on this album. Instead, what we get is exactly what we can expect from ambient-deities like these; outstanding and well-produced musical landscapes in the vein of their previous works. Overall, Deathprod takes it a bit noisier, darker and grittier while Biosphere focuses on the lighter, colder side of things. The combination of these two, however, is simply excellent. To some it might be creepy, dark and just plain scary but to ambient, and especially dark ambient and drone fans, this music is soothing and relaxing. It’s mainly for these people that this album is highly recommended. Davvero particolare l’uscita di oggi su Carnage per l’etichetta specializzata in ambient/noise/elettronica Touch. Vediamo una coppia costituita da due grandi solisti, che hanno fatto la storia nel panorama elettronico underground (neanche poi così tanto underground). 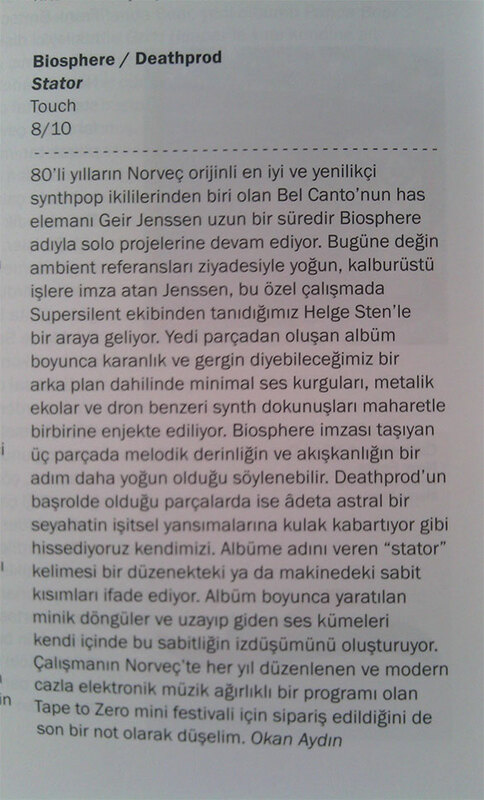 Parliamo del leggendario Biosphere, nome d’arte del norvegese Geir Jensen, e di Deathprod, moniker dell’altro norvegese tuttofare dell’elettronica Helge Sten. Il primo è famoso per la sua ambient techno (ricordate che nel 1995 il suo pezzo Novelty Waves, viene utilizzata per gli spot Levi’s): lavori come Substrata del 1997, hanno segnato un’epoca in cui IDM e techno si sono presi a braccetto, facendo tabula rasa di distinzioni ed etichettature. Deathprod è dal 1991 che produce musica sotto questo nome, manipola di tutto, dai nastri agli oscillatori, si fa anche chiamare Audio Virus, nei crediti delle sue registrazioni (è anche membro dei Supersilent e ha prodotto e collaborato con i Motorpsycho). Tutti e due sanno utilizzare il proprio stile e inserirlo all’interno di numerosi progetti. Ora che molto probabilmente avete letto cose già risapute (le presentazioni purtroppo sono comunque obbligatorie), passiamo a questa sorpresa che è Stator, uno split, e non propriamente un album a quattro mani. I pezzi che lo costituiscono sono dei singoli autori, che si alternano e che propongono ognuno la propria sonorità, il proprio strumento, la prospettiva personale. Affascinante vedere come, pur nelle loro somiglianze, i due si differenzino molto nel tono delle sfumature e nei dettagli della cura del pezzo. Partendo dal titolo del disco, Stator, vediamo una sua doppia definizione. Stator, nel vocabolario di ingegneria è la parte stazionaria di un dispositivo con meccanismo rotatorio di motore o generatore; in aeronautica è un sistema nonrotante radialmente assemblato con parti rotanti, come le eliche nelle turbine a gas. L’altra ulteriore definizione è dal latino, “colui che sta”, “colui che ha resistenza”. Anche qui, notare il molteplice significato del termine “resistenza”, sempre un doppio registro tecnico/umano. Biosphere sembra ricoprire questo primo aspetto, mentre Deathprod il secondo. La geometria cantabile di Biosphere si scontra con l’impressionismo lirico di Deathprod, che oltrepassa le strutture “apollinee” del primo. Su questo nucleo tematico/estetico avviene un confronto compositivo in cui i pochi elementi utilizzati, prendono a piene mani dall’indicazione delle definizioni: i movimenti rotatori, gli oscillatori, i rotary, direbbe un organista, si intessono (con Biosphere), si spostano e slittano sporcandosi (con Deathprod). Questa continua dicotomia, viene sottolineata anche dai singoli autori (si pensi al pezzo bifronte Shimmer/Flicker, le cui espansioni cedono il posto a rintocchi solenni e ripetitivi e che mandano a monte l’accordatura cantata dalle eliche di Muses In C di Jensen). Baud è l’alternanza tra diversi ritmi rotatori che genera una melodia minima, che si fonda sui cambi ritmici e tonali. I sussurri di Polychromatic di Deathprod decostruisce il lento lavoro di strutturazione del pezzo precedente (per mano di Biosphere) fatto di silenzi, pulsazioni vicine e colpi in lontananza. Ma è con Disc che, a mio avviso, viene raggiunto l’apice intimo del disco: Helge Sten prepara un bel tappeto di polvere su cui soffiare lentamente le sue risonanze, in grado di generare motivi archetipici e oscurità sconfinate. Ritorna Biosphere con il “pop” Space Is Fizzy, che si fa percussiva, minimalista, in stile reichiano (eleganza, razionalità e buon gusto: una lezione da tenere a mente). Optical spazza via tutto quello che la compostezza richiedeva, togliendo il velo della chiarezza e insudiciando la lente da entomologo che seziona, organizza e dispone sul solco acustico: droni prima (o dopo) la tempesta. Made under commission of Oslo-based mini festival Tape To Zero with the support by Arts Council Norway, this release pools the sonic exploration by two Norwegian kings of ambient music. Geir Jenssen, better known as Biosphere (the most recent trace on our zine has been left by his self-signed release “Stromboli”, an awesome release that he made from a series of field recordings taken nearby the hot edges of the notorious Sicilian active volcano), is a pioneering veteran of 90ies crosses between ambient music, electronica and proto-house, whose distinguishable aesthetics that spurted out of references to arctic landscapes and Russian space crafts reached out to many contemporary music lovers. He doesn’t really need introduction, as a matter of fact, while Deathprod, the musical id by Norwegian producer Helge Sten, is maybe less known, even if he’s the man behind the curtains of many releases on Rune Grammofon and already co-signed a tribute album to Arne Nordheim (1999), the Norwegian composer whose music was so intimately related to space exploration that astroners named the asteroid belt between Mars and Jupiter in his honor. The first inocoluted three awesome tracks, where he ignites this sonic journey by pensive micro-ambient sequences of light propulsions and suspensions, borrows the name of the unit for symbol or modulation rate in telecommunication, the baud, for the amazing extra-vehicular transmission “Baud” and forged a breathtaking track – “Space Is Fizzy” – in the aisle between synth-driven cosmic ambient and some cliff-hangers of his own “Microgravity”. The latter came in on the dimming elongated grandeur of “Shimmer Flicker”, liquefies silent particles on “Polychromatic”, blows over pulverized symphonies on the beautiful “Disc” and seems to drive an empty vessel between astral bodies on the final “Optical”. La prima volta di Biosphere e Deathprod insieme risale al 1998. Un incontro, apparentemente senza possibilità di sviluppo, centrato sulla volontà di omaggiare un monumento come Arne Nordheim da due prospettive totalmente differenti. L’ambient music divenuto sound art nella sua forma più sostanziale ed immersiva da un lato (si legga senza problemi: l’opposto del formalismo fotografico di Thomas Köner), il post-jazz orientato in direzione dark-ambient dall’altro. “Nordheim Transformed” fu quel che ne uscì, un lavoro senza infamia né lode, un compitino svolto con maniera senza prendersi rischi né riservare sorprese. Diciassette anni dopo, la storia si ripete. Se di Biosphere non si sentiva parlare da qualche anno – era il 2011 con “N-Plants”, poi vari progetti minori per teatro e cinema – l’ultimo bollettino firmato Deathprod da Mr. Supersilent Helge Sten risale addirittura ad undici anni fa. Dati, tutti questi, che effettivamente pesano su questo “Stator”, un disco che è sostanzialmente terreno condiviso in solitaria dai due artisti, che per la seconda volta rinunciano all’idea di unire le loro forze nella maniera più completa. Di nuovo nessun rischio: stavolta, semplicemente, Biosphere fa Biosphere e Deathprod fa Deathprod. Ricalcando con classe e senza qualche colpo di genio tratti grafici ormai noti. Da un lato dunque Biosphere, colui che dopo aver conciliato estetica e percezione coniando una serie di glossari autentici della musica atmosferica contemporanea, recentemente è spesso caduto nella tentazione di pescarvi a mani basse. Non che questo sia un male, a fronte del fatto che tutti i brani da lui firmati rientrano nel “meglio” dell’album. “Muses-C” apre sotto i migliori auspici e rimette in scena magistralmente il torpore ipnotico di “Dropsonde”, “Baud” gioca col minimalismo e non da spazio agli sbadigli per quanto sappia di incompiuto, “Space Is Fizzy” potrebbe essere un outtake di “Shenzhou” ma non è estraneo ad una classe sopraffina. La lunga astinenza dai soundscape elettronici riconsegna invece un Deathprod decisamente appesantito, i cui lunghi monologhi nel vuoto tendono in più d’un occasione a mancare di sostanza. È il caso di “Shimmer/Flicker”, lunga e lussureggiante esitazione su un drone solitario, tanto quanto del finale immersivo di “Optical”, “classica” tormenta di neve fra alte frequenze gonfiate e field recordings. Ma sintomatica di questa tesi è ancor di più “Polycromatic”, il cui ronzio avvitato e reiterato nel nulla rende il titolo sensato solo se considerato come un ossimoro. Il valore estetico è indiscutibile, ma dietro la forma sembra mancare un contenuto autentico. A fare eccezione è la sola “Disc”, che “vince facile” rifugiandosi nel calore di lievi soffi di armoniche, segnando di fatto l’unico punto di contatto fra i soundscape dei due artisti. La convivenza fra questi ultimi, nelle premesse non certo facile, si rivela invece elemento di vantaggio per il disco nel suo complesso. L’impianto narrativo si gioca infatti volutamente sul contrasto tra i fertili e vivi “rifugi” firmati Biosphere e le algide e desolanti esplorazioni nel vuoto di Deathprod. Una miscela vincente, a conti fatti, sebbene (per la seconda volta) l’impressione sia quella di un’occasione, di fatto, volutamente mancata. Certainly one key for unlocking this split album by Norwegian artists Biosphere (Geir Jenssen) and Deathprod (Helge Sten) lies in its title, for which two definitions are provided in the accompanying press release: in terms of electrical engineering, stator refers to “the stationary part of a rotary machine or device, especially of a motor or generator”; in an aeronautical context, the term refers to a “system of non-rotating radially arranged parts within a rotating assembly, especially the fixed blades of an axial flow compressor in a gas turbine.” Put simply, stator naturally has to do with stasis, yet movement is also part of the mix, too. Stator isn’t the first time the two have worked together, by the way: in 1999 they released a reconfiguration of composer Arne Nordheim’s music called Nordheim Transformed. The fundamental difference between the two projects is that the material on Stator is fully original, with three tracks credited to Biosphere and four to Deathprod (who also mastered the recording at his Audio Virus Lab). While the artists’ tracks are complementary, they’re also reflective of their different styles. In characteristic Biosphere style, sonar-like blips punctuate repeated exhales of gaseous emissions during “Muses-C,” which derives its strongest sense of animation from a bright, rather dubwise bass-and-percussion combination. “Baud” and “Space is Fizzy” exude rhythmic thrust, too, but are more notable for the cumulative impact of their sound design. Pulling the listener’s attention away from a kinetic bass-prodded pulse slithering through “Space is Fizzy,” for instance, are clockwork melodic patterns and percussive accents. Deathprod’s opening salvo “Shimmer/Flicker” is as macabre as anything else in Sten’s catalogue, even if the aggressiveness of its harrowing opening episode gives way to something a little less nightmarish (if still unsettling) in the second half. His major strike arrives at album’s end in the form of “Optical,” which swells into a billowing cloud mass in classic Deathprod fashion during its ten-minute run. That said, Sten largely hews to the quieter side of the sonic realm in his pieces without sacrificing anything in the way of atmospheric suggestiveness. Admittedly Stator, while a perfectly credible account of the two artists and their respective approaches, won’t be remembered as the album most representative of the artists’ best work, which are generally considered to be 1997’s Substrata for Biosphere and the 2004 box set for Deathprod (though arguments also could be made on behalf of Biosphere’s Shenzou and Autour de la lune and Deathprod’s Morals and Dogma on that count). Even so, Stator lives up to the implicit conceptual promise of its title in the way its seven settings reconcile stasis and movement. Stator begins with an extraterrestrial tearing sound idiomatic to Biosphere, the aurora borealis as it crackles in the sky, on “Muses-C.” Deathprod replies with “Shimmer/Flicker,” the reverberation of a giant gong, as proximate if one with the brass. Acid raindrops plash down on soft soil. “Baud” is Biosphere’s series of attempts to communicate a message through an alien, irregular Morse that is constantly being rebuffed, but which insists on continuing to transmit, until the message becomes the medium and twists into a pas de deux with its own echo. “Polychromatic” and “Disc” by Deathprod are two, brief exoplanetary fluorescences—one sunrise, one sunset. “Space is Fizzy” is Biosphere applying fuzzy logic to the clockwork universe of de La Mettrie—mankind a machine—no difference between living and dead material. Deathprod’s “Optical” is a ten-minute cloud of unknowing I would happily allow glaze my eyes over for another hour or two. Released in typically high-quality Touch packaging, slightly oversize gatefold sleeve, photography and design by label co-founder Jon Wozencroft. Here’s hoping a “true” collaboration lies in the not-too-distant future. Put on the circuit in late March was the 99th release – without any of the labels offshoots, that is – in the history of the legendary UK-based Touch imprint. Named “Stator”, the album provides us with a split longplay piece crafted by two of the finest names hailing from the Norwegian electronic music scene – Geir Jenssen, better known for being the man behind Ambient legend Biosphere and Helge Sten a.k.a. Deathprod. Together, with four tracks produced by Deathprod and three by Biosphere, they’re exploring the warm, mostly organic and beatless realms of Deep Listening Music, creating a sonic environment highly recommended for headphone consumption although Biosphere’s slightly tribalistic Ritual Ambient piece “Space Is Fizzy” might also well appeal to advanced dancefloors and surely will be referred to as stunning classic in future times whilst Deathprod’s cold’ish closing tune “Optical” is a ten+ minutes masterpiece in terms of Drone / Death Ambient. Recommended. Naiv pockernde elektronische Sounds ziehen dann in “Baud” hoch, Erinnerungen an die noch experimentellen Kraftwerk kommen hier hoch (Radioaktivität Zeit). Auch hier gelingt es bei aller Klangkunst eine dunkle Melodie zu formen. Stator – Ständer im Drehstromgenerator, Drehmomentstütze, Motorständer. Äußerst kryptisch gibt sich die Betitelung dieses gefährlichen Ambient-Kolosses der beiden Künstler und Produzenten Geir Jenssen (Biosphere) und Helge Sten (Deathprod), die sich auf dieser Veröffentlichung abwechselnd die Klinke in die Hand geben. Dunkel, geduldig und organisch wabert dieser Obelisk von einem Album dem Hörer entgegen. Ein musikalisches Damoklesschwert, welches mit seiner einladenden Düsternis in die tiefsten Abgründe entführt, und jede Form von Panik dabei vor Ausbruch im Keim erstickt. Stator finds Biosphere and Deathprod, two of Norways’ most elusive and cherished ambient producers teaming up for a second round of brooding transcendence and refined, tonal dismay. Having last teamed up in 1998 for a split of sorts reimagining and retooling works by fellow Norwegian composer Arne Nordheim, who was largely active from the 1960s until his passing in 2010, the pair now return with a split LP of original work, illustrating the undeniable overlap in each composer’s current aesthetic. While Biosphere (aka Gier Jenssen) came from the world of electronic music, ushering in the ambient techno movement of the early 90s before pivoting to stark but dense ambient music, Deathprod, aka Helge Sten, became active much later, working with bleak soundscapes and avant-jazz with the likes of Supersilent and the rest of the Rune Grammofon cohorts. Each producer creates unparalleled bouts of foreboding beauty, but when paired up, lends a Biosphere opens the disc with “Muses-C,” a palette cleanser of sorts that wipes the slate clean with deeply vacant chords of subtle dismay and eerie, creaking blips of melody. Soon enough, the scene begins to take shape, cycling through a series of solemn, synthetic chords and tone patterns. Sounds drip like droplets from stalactites in a cavernous pool of the Norwegian’s signature atmospheres. Those droplets begin to amass larger, heaving floods of low-end, crippling the paced ambiance with earth-shaping tonal movements. Slow, rhythmic undulations roll through the space, giving a rocky bed of pulsing bass. Deathprod’s “Shimmer/Flicker” plays the generous counterpart, foiling Biosphere’s ominous but hopeful beginning with massive, haunted drones we’ve come to expect from the project. Sounding like the acapella climaxes from 2001: A Soace Odessy only abstracted and smeared into a doom-obsessed canvas, Sten shows the utterly brilliant and maximal fruits of working with the sparsest of tools. Using only a spare time here, drawn out into exquisite oblivion there, Sten works a handful of resonances into a solemn, foreboding symphony of dread. The narrative jumps back over to Biosphere, letting in a bit of light with “Baud.” Perhaps taking cues from Sten, Geir deploys a series of tones and counter-tones that drift and air out organically. Slightly oscillating tones play off one another like ripples of sound, almost with a breath and sense of being all their own. Distant throbs weave their way through the sequence, allowed to ebb and flow, direct and redirect at will. But the beauty lies in various calculated glitches, which create fleeting micro-symphonies written for an unknown admirer. The track seems to ride out with complete disregard for anything outside of its realm, slowly dying with each weighted breath. Deathprod’s “Polychromatic” and “Disc” continue the tone study, almost demanding experience via headphones. Almost inaudible blips, clicks and pops comprise a bulk of Sten’s sonic arsenal here, with silence being the biggest. Harkening back to Mille Plateaux’s flagship click-and-cut aesthetic but with a much darker, more sinister slant. Both track, although briefer than all others here, present massively lamentful drone studies with only necessary flecks of light and movement. It’s easy to get lost in without a care or want to find your way out.